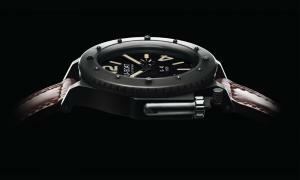 One of the highlights of Baselworld 2010 was the U-Boat booth. Not only did this edition of the watch fair inaugurate U-Boat’s inclusion in the main hall, amongst greats such as Rolex and Patek, but this achievement was backed by the manufacturer with the release of some very impressive, new models. Amongst these, perhaps the most anticipated by U-Boat watch fans, was the U-42. Fans were not disappointed. The U-Boat U-42 is closely related to last year’s 65mm U-1942, albeit more accessible in many ways. 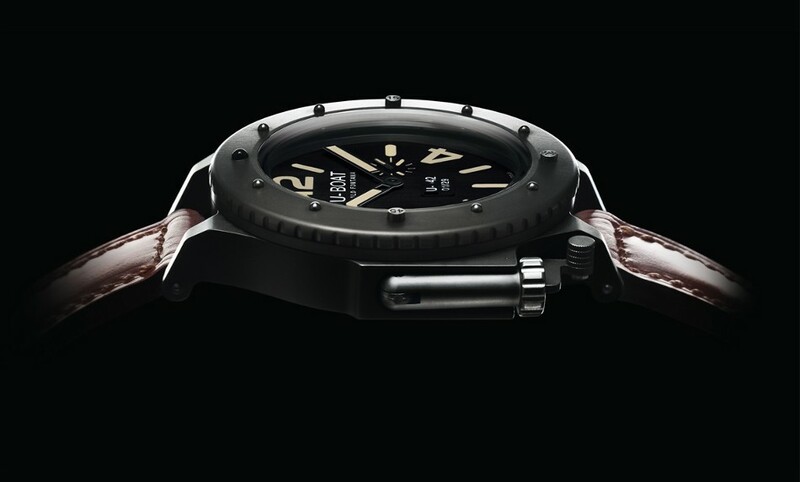 The case of the U-42 is 53mm, which is par with basic Classico models. While this is still a decisively oversize watch, it is remarkably comfortable on the average wrist. The price took a welcome turn downhill from the $40k of the U-1942 to an estimate CDN$7K for the U-42. 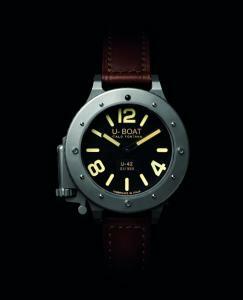 The look of the U-42 as well as a few other things are directly inspired by the U-1942 such as the use of grade 5 titanium and limited production. Only 999 of the U-42 will be manufactured in each dial variation. A few peculiar aspects of the case set the U-42 apart from other watches. The most obvious is the crown system. The crown of the watch is actually quite long and therefore has to fold into the case where it is held in place by a trigger-like mechanism. The functionality behind this is related to the history of this timepiece. Italo Fontana, owner and designer of U-Boat, based the U-42 watch on a design that his grandfather had produced for the Italian Navy. The size and length of the crown were meant to facilitate operation while wearing thick, protective diving gloves. This heritage also explains how the U-42 came to be a diving watch with a water resistance rating of 300 meters. The best way to appreciate this distinctive crown system in action is to see it. I show this as best I can in this video taken directly at the U-Boat booth in Basel. The U-Boat U-42 is amongst many watches released this year that attempt to capture a vintage style. The difference is that Italo Fontana does it in a way indicative of U-Boat watches, largely by drawing inspiration from his own grandfather’s actually vintage design. The thick rugged strap, and even the smoky tone of the high grade titanium marry well with this concept. The U-42 is conspicuous and unique, but its bark is backed by the quality of its materials, manufacturing, and its Swiss automatic movement.